It will be a night for of music and soul at the Music Museum on July 17 as Thor Dulay, KZ Tandingan and Liezel Garcia will bring heartfelt songs that everyone will fall in love with. Both coming from different singing reality shows and mentored by the best singers in the country; Thor from The Voice of the Philippines Season 1, KZ from The X-Factor Philippines and Liezel from Pinoy Dream Academy Season 2. The Aqueous Group and Company and its subsidiary Aqueous Events will be the producers of the Soulful Concert 2015 at Music Museum. There will be more surprise guests that will join the concert to give you good music and relaxing mood perfect on a Friday night. Ticket prices include VVIP Php 2,500, VIP Php 2,300, Patron Php 1, 800. 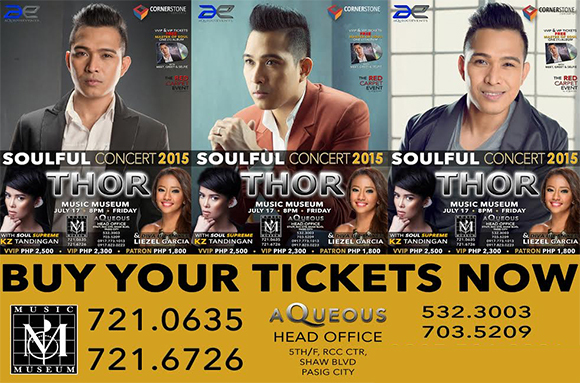 VVIP and VIP ticket holders will receive free Thor’s Master of Soul album. For tickets call Music Museum at 721.0635 and 721.6726. Or visit Aqueous Head Office at 5th Floor, RCC Center, 104 Shaw Boulevard, Pasig City or just call 532.3003 and 703.5209. More information at www.facebook.com/TheAqueousEvents. Previous ArticleMelai Cantiveros-Francisco as Miley Cyrus is the Your Face Sounds Familiar Grand Winner!